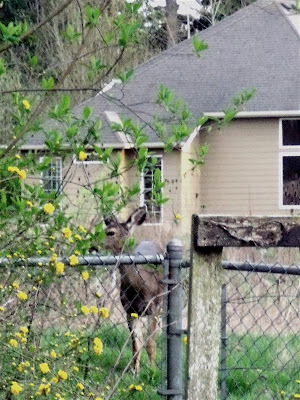 Little Swamp Creek: A Kenmore Herd?!? Then, in the time that it took me to find the camera, four of them were there! That was a rather surreal sight, actually. It would be SO interesting to know where these deer wander throughout a day. The 90+ acre wetland behind us provides a lot of room to roam, but to move from there to another greenbelt would require crossing a fairly busy street no matter which way they go. One of the streets being Bothell Way/SR522. Unless they go under Bothell Way by wading in Swamp Creek. That connects to lots of undeveloped land that is for now called Swamp Creek Park. Four deer wandering around together are going to be hard for people to miss! Cool news for your neighborhood, unless, of course they're raiding gardens. 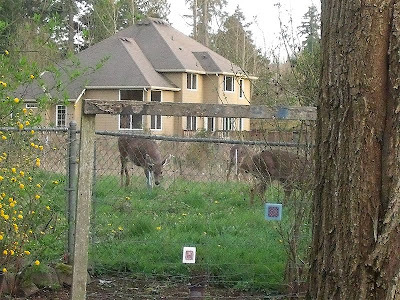 I was stunned one early morning two years ago to see six deer walking through a part of our neighborhood near Arrowhead Elementary School. Of course we're adjacent to Saint Edward State Park, but I'd not seen a single deer in the prior 20 years. 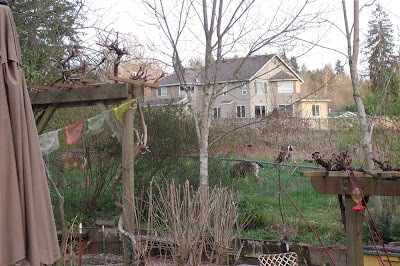 Our neighbors' yard is open to the field behind us, and they have experienced a lot of munching of their garden in the last year or two, between the deer and rabbits. I saw the rabbits in the field for the first time last year. We rarely hear coyotes anymore, and I wonder if that's why the rabbits are surviving back there. Some coyotes live in the ravine between Juanita Drive and Arrowhead Drive, across from Arrowhead Elementary. I've seen them occasionally in the early morning. Cats don’t fare well here either - coyotes or large owls take a toll.